Most workers dream of retiring to places replete with warm weather, nearby beaches and lush landscapes. But according to Bankrate’s latest study, people may want to trade in those sun-soaked dreams for a place known for bone-chilling winters, rowdy NFL fans and world-famous sandwiches stuffed to the brim with french fries, coleslaw and shaved steak — Pittsburgh, Pennsylvania. Pittsburgh nabbed the top spot thanks to a ‘very low’ cost of living and crime rate, ‘good’ healthcare and well-being, a sizeable population of baby boomers and an ‘average’ level of taxes and things to do. Of course, the Steel City didn’t rank so well when it comes to weather and public transit, but investing in a good pair of boots and winter tires should suffice. 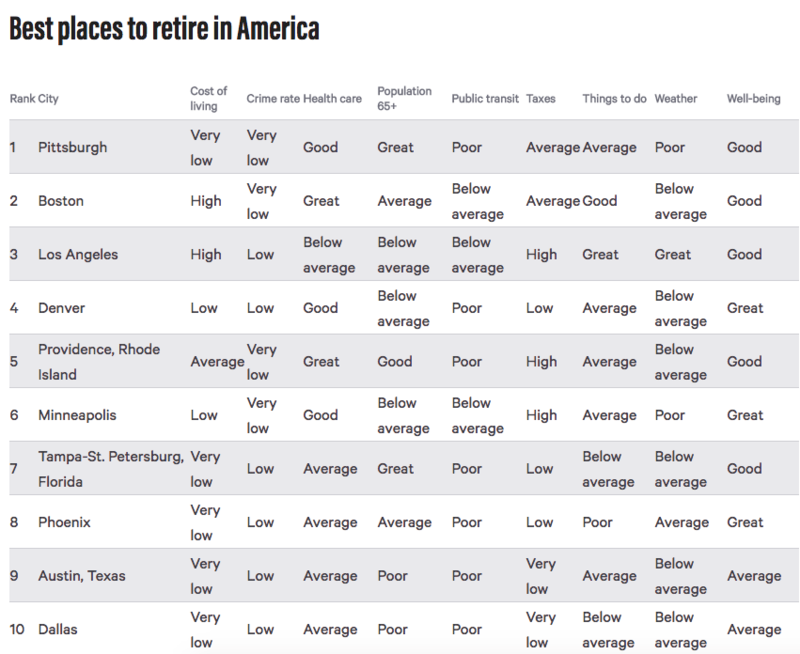 Boston, Los Angeles, Denver, and Providence, Rhode Island rounded out the top five, while Indianapolis; Buffalo, New York; Louisville, Ky.; Memphis, Tenn.; and Riverside, Calif. ranked rock bottom due to a number of factors, including lack of access to good healthcare, low population share of those aged 65+, low well-being rankings and a lack of things to do. See where your city ranked here. Bankrate scored the 50 largest U.S. metro areas based on nine factors: health care quality; tax burdens; crime rates; living costs; weather; public transportation; cultural amenities (things to do); percentage of the population over 65; and the overall well-being of seniors, as measured by the Gallup-Sharecare Well-Being Index. Sources: U.S. Census, The Tax Foundation, Creative Vitality Suite, National Oceanic and Atmospheric Administration, The Council for Community and Economic Research, United Health Foundation, Gallup Sharecare Well-Being Index, Federal Bureau of Investigation, Healthview Services, Bureau of Transportation Statistics.